For most general valley, hill and easier mountain walking there are plenty of gloves in this price range that will suit your needs. Some care is needed in choosing models, however, as some may come in a very small size range, for example. The gloves are often made of polyester rather than more durable nylon, and may have more seams on the palm and fingertips than other more expensive gloves so they tend to be less durable in the longer term. They will generally lack some of the nice-to-have benefits of gloves in higher price brackets, but for easier or less regular walks to the mountains they still work well. Compared to lower priced gloves, you get some nice-to-have benefits in this price range. These may include roll-tip fingertips that ensure there are no seams on the fingertip, which leads to improved fit, dexterity and durability. Some gloves may have touchscreen-compatible fingertips so you can use electronic devices without having to remove your gloves. For extra durability you will often have nylon shell materials rather than less-durable polyester, and you may get a leather-reinforced palm. 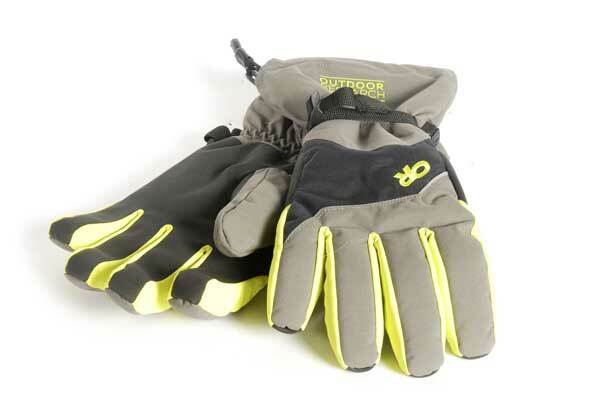 The waterproof materials and insulation will generally offer better performance than lower-priced gloves. This mid-price and mid-performance range is ideal for regular winter hill and mountain walkers as the additional benefits will be noticeable. IT'S GOOD The main benefits of this glove are the low price tag and nose wipe. There is also a women specific version. Made of polyester with an ARED 5000 waterproof lining, it features synthetic insulation, a fleecy lining and palms reinforced with a textured rubbery material for a better grip on trekking poles or ice axes. The fit is quite good, with a Velcro wrist adjustment allowing this to be locked in place securely. The short cuff easily fits inside a jacket sleeve. HOWEVER The cuff is quite short so some care is needed to make sure that there is no gap between your jacket sleeve and the glove when putting these on. The fingers don’t get the roll-tip design either, so there are seams at the fingertips, which can be an issue from a dexterity and durability perspective, although for general walking this is probably not too much of a problem. Higher-priced gloves tend to be warmer and have a more durable shell made from nylon. There is no wrist leash, either. So overall if you pay more there are definite benefits that regular users will welcome. VERDICT A low-priced glove that’s good for hillwalking, but lacks some of the benefits on offer with gloves that have a higher price tag. IT'S GOOD There is a little more warmth here than others at this price due to the use of Primaloft insulation and hi-loft fleece lining. There is also an X Dry waterproof lining. The shell is polyester with a PU palm and roll-tip fingers for dexterity and durability. The fingers are also slightly pre-curved so that the fit is close and you can lock the wrist into place with the webbing buckle. The cuff is short enough to be tucked inside a sleeve cuff, but long enough to wear outside it, too, and can be cinched in with a drawcord. HOWEVER The size range is limited and there is no women-specific version. Also the amount of insulation and close fit means it’s could be too tight if you have bigger fingers. Extra insulation also means dexterity is not the best. Like many other gloves, a nylon rather than polyester shell and a leather palm would increase durability and there is no wrist leash. There is no nose wipe provided. The cuff is medium length, which you may or may not prefer. VERDICT Good overall and particularly warm winter glove for hillwalkers, but others do have improved benefits in terms of better. IT'S GOOD There are lots of gloves at this price but this one has extra benefits, including a men’s and women’s range, with a rubbery palm that helps to grip trekking poles or ice axes. I also like that the ‘roll-tip’ fingertip seams are moved back to the top of the fingers for better durability and dexterity. The main material is nylon on the back of the hand, so it’s more durable than polyester and you get a Ventia waterproof lining with polyester insulation. A webbing wrist cinch strap locks the glove in place and you can wear the cuff inside or outside a jacket sleeve. HOWEVER It’s not the warmest glove available, although I’ve found it fine for use in wild winter weather. There is no wrist leash so care is needed not to drop them. There is no nose wipe, either. Gloves with a slightly closer fit and slightly more dexterity are more expensive. A leather palmed glove will be even more durable. So while it has good features, it also lacks some nice additional benefits. VERDICT Very good all-round fit and performance that would be ideal for most hillwalkers in the UK, but some others are slightly warmer and have additional benefits. IT'S GOOD A well-proven glove that has been updated for this winter to improve fit and dexterity. It’s also available in men’s and women’s versions. It has a Drilite waterproof lining, a leather palm and a fibre pile lining. The fit is pre-curved at the fingers so this sits nice and close to the hand. The lining does not snag so you whip these on and off easier than many, and while the cuff is not the longest, you can fit it inside or outside a jacket sleeve and you get a drawcord to close it. A soft nose wipe and loops on the finger to clip the gloves to a karabiner complete the walker-friendly design. HOWEVER In the update the wrist leash has been removed so you have to keep a grip of them when taking them off in the wind to look at maps or GPS receivers. Also, they are not as warm as some other gloves. While the cuff can be slipped into a jacket sleeve you do need to be careful to prevent air gaps around the wrist, which a longer cuff would more easily avert. Some gloves have an additional wrist adjustment, but these just have elastication – which is fine if this fits you well. You can potentially spend less and get all you need for hillwalking. VERDICT A good all-round glove for winter but not the warmest option, the cuff is not the longest and the handy wrist leash has been removed in the update. IT'S GOOD This one features a Gore-Tex Active waterproof lining and synthetic insulation to provide a good level of warmth for mountain use, and a leather palm for durability. A close fit with good pre-curved palms makes holding trekking poles very easy. The wrist is quite close fitting, and you get an additional webbing strap and buckle to lock down this area even more. The cuff is short and easily sits inside a jacket sleeve, and you get a soft nose wipe on the thumb. The price is pretty good compared to some options. HOWEVER The size range is smaller than others and there’s no women’s option, so some may struggle to get a good fit. Dexterity is better in higher-priced gloves, in part as the finger fit is not as neat and the lining is a little loose. The cuff is quite short, which is fine if you can be bothered mucking about getting it tucked inside your jacket sleeve – but a bigger cuff is quicker and easier to use, and more convenient in conditions (such as cold, dry and windy weather) when speed is of the essence. There is no wrist leash, either. VERDICT Good for winter hillwalking in rain, but fit and dexterity is not quite so precise as others. The shorter cuff makes it trickier to fit them over jacket sleeves for speed. IT'S GOOD This is a lightweight and more minimalist design than others on test, with the benefit of extra durability in the palm thanks to an extensive layer of leather. The nylon soft shell outer has Primaloft insulation inside as well as a Gore-Tex waterproof lining. I found the fit to be closer and more precise than many others; the wrist and cuff is close-fitting too, and you get a Velcro tab adjuster, resulting in cuffs that fit easily inside a jacket sleeve. You also get a nose wipe on the thumb. Great if dexterity and durability are your priorities. HOWEVER These are not as warm as others, so are for chilly days rather than really cold weather. The short cuff means your wrist area is less well protected than with other options, so again they are best for milder winter days. You don’t get a wrist leash, so you have to keep a grip on them in the wind if you take them off. In comparison with higher-priced gloves of this type the Tornados offer a little less durability, warmth or protection, but are still good at the price. VERDICT Ideal for technical mountaineering and scrambling, as well as walking in milder conditions, but these gloves offer less hand insulation and protection than others tested here. IT'S GOOD A 3-in-1 glove has a liner glove, an outer glove and the two can be worn together to provide a third option. Here you get a liner glove with a sticky palm for better grip of ice axes or trekking poles and the E-Touch material works on touchscreen devices. The shell itself is insulated with synthetic fibre and is waterproof thanks to a Texapore lining. You also get suede PU palm reinforcement. The cuff is quite short and easily fits inside a jacket sleeve; you also get a nose wipe. A clip on each glove secures them into a pair and you get a wrist leash, too. So there’s lots of good features here. HOWEVER You can wear the outer glove on its own, but the fit is slightly loose so dexterity is reduced. The wrist leash is elasticated, so the gloves tend to catapult around a little if you are not careful when you take them off in the wind. While the cuff is okay, it’s quite short; a bigger cuff can be quicker and easier to adjust around the wrist without cold spots, and in bad weather when your taking gloves on and off to operate maps or GPS receivers. Like many gloves, there is no women-specific option, so it’s worth trying the unisex version on before you buy. VERDICT This 3-in-1 design provides comfort in a wide range of conditions that would suit many hillwalkers, but it does have drawbacks. IT'S GOOD This is intended for climbing, fast-and-light ascents and mountaineering when you need warm hands with minimal fuss. Here, you get a simple design with a leather palm and fingers for maximum durability, waterproof Gore-Tex lining and Primaloft insulation. There’s a karabiner loop on one finger of each glove so you can clip them to a belt or harness, plus Velcro tab adjustment at the wrist. They do fit nice and close and have greater dexterity than other gloves, which is great for more technical ground. They are warm too. Also, as they have no cuff, you can easily stash them in a pocket when not being worn. HOWEVER Short cuffs mean that your wrist area can get cold, and there is no wrist leash so if you take them off you need to keep a grip to prevent them blowing away. They have no securing clip, either. With these drawbacks, compared to more walker-orientated designs, the price is steep so you need to decide if only the benefits of durability and dexterity are what you really need. VERDICT An extremely durable glove that offers exceptional dexterity, but it lacks the features of other designs, making it more mountaineer-orientated than walker-orientated. IT'S GOOD Designed for ice climbing, but the extra features make it great for handling ice axes, trekking poles and scrambling over a rocky winter ridge to a summit. There is a Gore-Tex Active waterproof lining inside, with shock-absorbing gel on the bag of the hand to reduce impact from knocks, while leather reinforces the palm for durability. Kevlar throughout the palm of the hand and fingers increases durability further. You get a soft nose wipe and a cuff that can be slipped inside or outside a jacket sleeve. There is a wrist leash and cuff adjustment, and they are well insulated for winter, too. The fit was very close and, since the palm is pre-curved, felt very natural and dexterous. HOWEVER The price tag is steep and there is no women-specific version, so you need to think if you really need the benefits, which are primarily down to durability at the palm as well as those gel inserts to take out any knocks from rocks. Some other gloves do have longer and wider cuffs, and wrist adjustment, too. VERDICT Great for climbing or mountaineering, but the Ice Gauntlets offer more performance than hillwalkers need so you can save cash easily and still be well equipped with a less-expensive option.